BOTTOM LINE: Helder Guimarães demonstrates that his skill speaks for itself, sending his audience reeling down a delightful mental trip. Helder Guimarães is renowned not only as one of the best, but as the youngest magician to have reached his level of skill in close-up magic. For the uninitiated, this is the genre within magic where illusions are (or can be) performed 10 feet or less from the audience. It requires the utmost sleight of hand, even at New World Stages with its many rows of seating, and Helder Guimarães proves that he’s more than prepared for this kind of challenge. 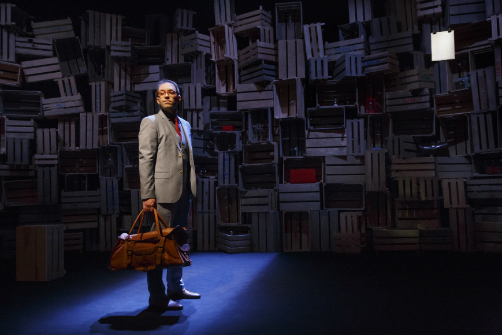 Guimarães was last on an Off Broadway stage in 2012 with Nothing to Hide, a collaboration with magician Derek DelGaudio. Derek and Helder formed a comedic duo, with DelGaudio teasing that Guimarães’ persona was a “Portuguese muppet.” In Verso, Guimarães takes a more philosophical route, investigating the idea of Truth with thoughtfulness and wit. He shares stories from his own life about his experiences with falsehoods that seemed true—a photo that defined his personhood, his feelings about a friend’s marriage— as well as more well-known truths that seem false, like a cat’s ability to find its way h­­ome after a journey of many miles. Somewhere in between our perception of reality and unreality, truth and untruth, he argues for the presence of the surreal. In these anecdotal moments where Guimarães is presenting a thought experiment that will lead into his next trick, perhaps he could warm up his presentation style. He can come off a little “Corporate Motivational Speaker” in his delivery of well-practiced anecdotes. When he’s directly interacting with the audience, however, he is generous and friendly, never pushing volunteers further than they’re comfortable, and maintaining a sly dominance over even the most rambunctious audience members. The combination of the in-jokes he establishes with different volunteers over the course of the show, and their reappearance in his stunning finale, would inspire any performer who seeks to connect with their audience. Add Guimarães’s pure technical skill and easy rapport with volunteers to a well-polished, balanced routine of “mentalist”-type predictions and lie-detector tricks, as well as a few flashy disappearances/reappearances of objects that couldn’t possibly have reached their end locations without an assistant’s help—right?—and Verso is an evening you’ll remember for a very long time. Marques. Lighting Design by Pedro Vieira de Carvalho. Music by Pedro Marques. Creative Consulting by Kelly Devine. Scenic Design by Mary Hamrick. Direction by Rodrigo Santos. Produced in New York by Rodney Rigby, Latitude Link, Eva Price, Kevin Kinsella, Alexis II Fund, David Lara, Barbara Monocherian, and Richard Winkler/Heni Koenigsberg.